The application window is divided up into a number of rectangular areas. Areas reserve screen space for Editors, such as 3D Viewport, or an Outliner. Area boundary is indicated by rounded (beveled) corners. You can resize areas by dragging their borders with LMB. Move your mouse cursor over the border between two areas, so that the cursor changes to a double-headed arrow, and then click and drag. Splitting an area will create a new area, and joining of two areas will close one area. 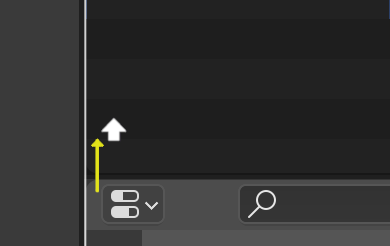 Placing mouse cursor in area corner will change cursor to a cross (+) to indicate that pressing down LMB will activate splitting or joining command. Dragging from area corner inward will split the area. You define the split direction by dragging either horizontally or vertically. Dragging from area corner outward will join two areas. The area that will be closed gets a dark overlaid arrow. You can select which area will be closed by moving the mouse over areas. Release the LMB to complete the join. If you press Esc or RMB before releasing the mouse, the operation will be aborted. Areas to be joined must be the same size (width or height) in the direction you wish to join, otherwise nothing will happen. This is so that the combined area remains a rectangle. RMB on the border opens the Area Options. Shows an indicator line that lets you select the area and position where to split. Tab switches between vertical/horizontal. 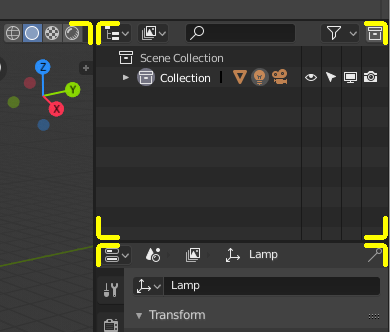 Shows the join direction overlay. 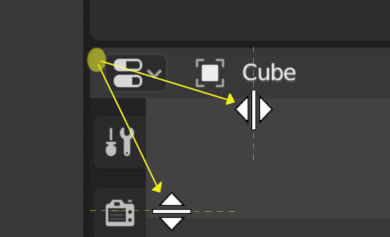 You can swap the contents between two areas with Ctrl-LMB on one of the corners of the initial area, dragging towards the target area, and releasing the mouse there. The two areas do not need to be side-by-side, though they must be inside the same window. A new floating window containing an area can be created from View ‣ Duplicate Area into new Window. The new window is a fully functional window, which is part of the same instance of Blender. This can be useful, e.g. if you have multiple monitors. You can also create a new window from an existing area by Shift-LMB on the area corner, then drag outward slightly. The window can be closed with the OS Close Window button. The maximized area fill the whole application window. You can maximize an area with View ‣ Toggle Maximize Area menu entry or keyboard shortcut Ctrl-Spacebar. To return to normal size use keyboard shortcut or the Back to Previous button on the Top bar. The area your mouse is currently hovering over is the one that will be maximized using the keyboard shortcuts. The fullscreen area contains only the main region. To exit the fullscreen move the mouse to the top right corner of the area to reveal the return icon.